Seeking to provide a permanent home for the brief comments on yesterday's home page update, this commentary serves as a follow-up to Francis The Logician, which dealt with the effort by Italian Vaticanologist Sandro Magister to draw inferences from the book that Jorge Mario Bergoglio/Francis co-authored with the pro-abortion, pro-perversity Talmudic rabbi named Abraham Skorka. 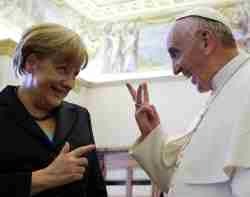 (Vatican Radio) This morning, Saturday May 18, 2013, in the Vatican Apostolic Palace, the Federal Chancellor of Germany, Angela Merkel, was received in audience by Holy Father Francis. Afterwards, Merkel met with Mons. Dominique Mamberti, Secretary for Relations with States. During the cordial conversation, the long history of relations existing between the Holy See and Germany was discussed, with emphasis on themes of common interest, such as the social, economic, and religious situations in Europe and in the world. In particular, topics of discussion included the protection of human rights; persecution of Christians; religious liberty; and international collaboration for the promotion of peace. So much for the "photo op" theory, Signore Magister. So much for "papal" dignity. Angela Merkel is a Lutheran? A photo-op with her is all right as it did not take place in the Novus Ordo travesty? All right. Anything you say. Second, how can Jorge Mario Bergoglio/Francis prevent scandal from refraining from distributing what he thinks is Holy Communion to public sinners yet he permits others to do so? It is a feat of extraordinary illogic and irrationality to claim that it is less of a scandal for a conciliar presbyter or deacon or "Extraordinary Minister of the Eucharist" to give what purports to be Holy Communion to a known public sinner than it is for a"cardinal archbishop" or a conciliar "pope" to do so. 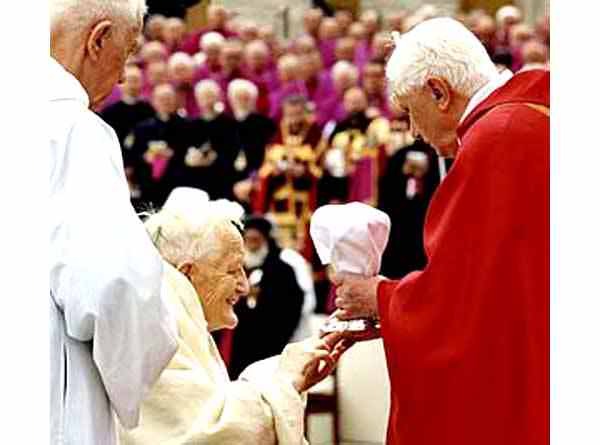 Does Jorge Mario Bergoglio/Francis believe that it was a scandal for the then Joseph "Cardinal" Ratzinger to give what purported to be Holy Communion to the Protestant syncretist Roger Schutz at the so-called "Mass of Christian Burial" of Karol Wojtyla/John Paul II on Friday. April 8, 2005? Jorge Mario Bergoglio/Francis might argue that there was no scandal caused by what "Cardinal" Ratzinger did as Roger Schutz is not a public sinner who, according to his, Bergoglio/Francis's own criteria, has withheld just wages from the day laborer or oppressed the poor. No, Roger Schutz was simply a Protestant, a man who was outside of the Catholic Church, a man who lived and died as a Protestant no matter the efforts of some in the conciliar Vatican to claim that he had converted to the Catholic Faith but kept the matter secret (see Brother Roger Schutz Died a Protestant). 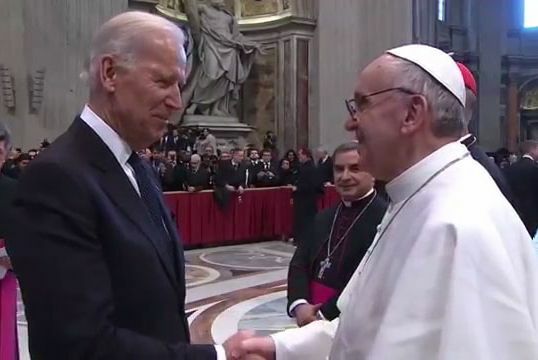 Jorge Mario Bergoglio/Francis did not have to meet with Joseph Robinette Biden, Jr. He chose to provide a photo-opportunity to the first Catholic to serve as the Vice President of the United States of America. Yup. So much for the Sandro Magister "photo op" theory, which was extrapolated from that 2010 book the false "pontiff" co-authored with that pro-abortion, pro-perversity Talmudic rabbi, Abraham Skorka. 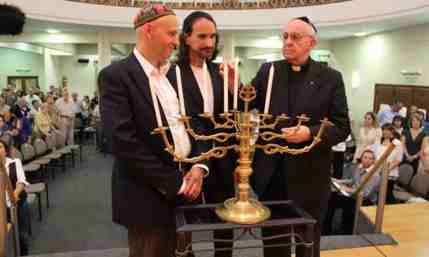 Must it also be pointed out that Bergoglio/Francis is a complete hypocrite and without a shred of personal integrity as he has no problem with violating the Canon Law of the Catholic Church by entering into a Talmudic synagogue, thereby lending credibility to this false religion, no less one whose rabbi, with him he co-authored a book, supports the destruction of the innocent preborn under cover of the civil law and the legal protection of "marriage" for those who are engaged in perverse sins against nature. Amazing feats of illogic and hypocrisy. Yes, yes. Francis the Logician. Fifth, the whole business of deciding whether to distribute what purports to be Holy Communion to pro-death and/or pro-perversity public officials is fraught with casuistry and sophism. A Catholic is either in the Church or he is not. Those who have excommunicate themselves by virtue of supporting grave evils must be warned about their behavior. If such medicinal warnings fail to effect conversion and repentance, the penalty of a formal excommunication known to all must be imposed for the good of the souls of the public sinners and for the good of the faithful, to say nothing of the protection of the integrity of the Holy Eucharist. Some might suggest that even an excommunicated sinner might approach to receive Holy Communion and that it would be a disruption of the good order of the distribution of the Sacred Species to cause a "scene" by refusing such a person. The answers to this objection are simple: (1) It is a far easier thing for an excommunicated person to be passed over while kneeling at the communion rail than it is for one who is standing in line with people behind him; (2) There is nothing more charitable one can do for an unrepentant sinner than to remonstrate with him, yes, even in public after he has been warned and then solemnly excommunicated. This might create a "scene." Truth be told, however, the fact that this is even an issue is the result of the loss of the integrity of the Holy Faith by the conciliar officials and thus by most, although not all, of the laity. A blithe acceptance of sins against God by means of open, public and thus very scandalous violations of the First, Second and Third Commandments will result in a blithe acceptance of almost every sinful situation as something that is "understood" and "accepted" by a "merciful" and "charitable" God. Apostasy does have consequences. 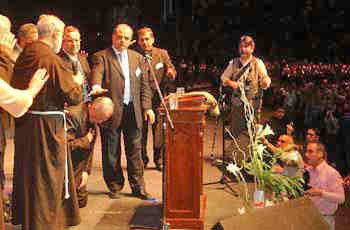 Furthermore, the conciliar "bishops" are paralyzed by cowardice, fearful of what the "people" and the "press" would think of them if the act as "meanies" and discipline pro-aborts and pro-perverts although the huff and puff against economic policies they believe to be unjust and against the death penalty and in favor of legal rights for those who have entered this country illegally, and conciliar officials in the Occupy Vatican Movement are absolutely paralyzed by the heresy of episcopal collegiality, which makes efforts such as Bergoglio/Francis's recent letter to the Argentine "bishops" urging them to refrain from distributing what purports to be Holy Communion to those who support baby-killing and "gay marriage" are completely unenforceable. We need to pray for the conversion of the conciliarists as we pray for our own conversion as we seek with a pure motive to serve God as by surrendering ourselves to Him through the Sorrowful and Immaculate Heart of Mary. That is is all that matters. The Immaculate Heart of Mary will indeed triumph in the end. Continue to pray as many Rosaries as your state in life permits. Remember that it is a privilege to live in these challenging times as this is the time from all eternity that God has appointed for us to live and thus to know, love and serve Him through His Catholic Church in this time of apostasy and betrayal. Saints Gordian and Epimachus, pray for us.